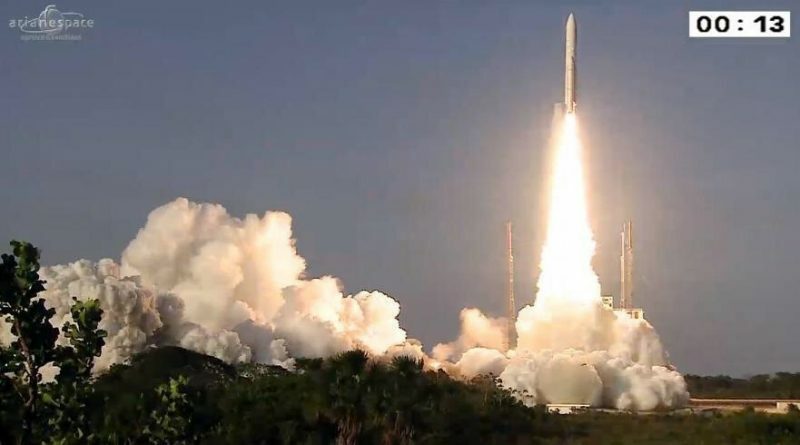 An Ariane 5 rocket took to the skies on Wednesday, blasting off from the Guiana Space Center to boost a pair of communications satellites to orbit for government enterprises in Argentina and Australia. The European workhorse once again delivered a picture perfect mission, launching at 20:30 UTC and sticking to the conventional mission profile to head to a low-inclination Geostationary Transfer Orbit for the release of the two payloads, Sky Muster and ARSAT-2. 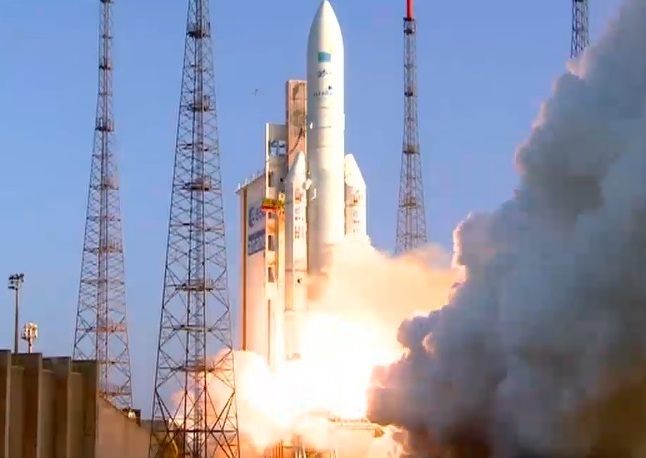 The Sky Muster satellite is the first of two NBN-Co. 1 satellites designed to deliver high-speed broadband to Australia to reduce the digital divide, providing high-capacity services to those who do not have access to the terrestrial network. Sporting a whopping 202 Ka-Band transponders, Sky Muster will generate a large amount of communication beams to provide coverage to remote and rural areas across the Australian continent as well as the coastal islands and external areas as far as Antarctica. ARSAT-2 builds on the success of ARSAT-1 that became the first large satellite projected headed by Argentina – developing a new satellite bus, integrating it with parts provided by foreign contractors and operating the satellite once in orbit. Argentina identified the capability of building and operating its own satellites as a long-term goal to be independent of foreign entities. ARSAT-2 will join the first satellite in delivering TV and data services to the entire American continent using a hybrid payload operating in the C- and Ku-Band frequencies. Prior to the launch of Ariane 5 VA226, ARSAT and Arianespace signed a contract for the launch of the ARSAT-3 satellite in 2019 to continue the expansion of communications services offered by the ARSAT fleet. The contract also includes options for two additional launches in the 2020-23 time frame, also for three-metric-ton communication satellites. 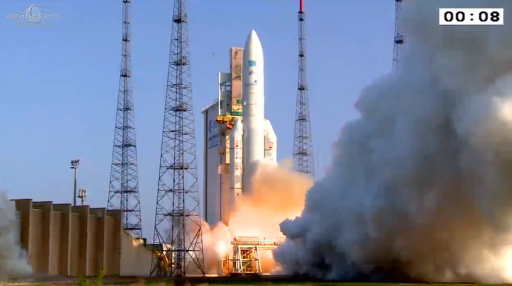 Topped with a payload of just over ten metric tons, the Ariane 5 rocket headed into its countdown eleven and a half hours prior to the opening of the day’s 105-minute launch window. For the first few hours of the count, teams at the launch pad wrapped up the final hands-on tasks to set up for propellant loading and close out all systems on the ground and the rocket. Activation of Ariane 5 occurred at L-7.5 hours to enable the launcher to go through a detailed set of tests of its various subsystems under the watchful eyes of the controllers in the main launch control facility and mission managers in the Jupiter Control Center. Ariane 5 completed tests of the Flight Control system, its propulsion systems, communications in C- and S-Band, and Flight Termination System. With checkouts showing good results and readiness announced from tracking stations and satellite teams, Ariane 5 headed into propellant loading operations five hours ahead of T-0. Tanking started with the preparation of ground systems that were chilled down in order to be able to handle the supercold Liquid Oxygen and Liquid Hydrogen propellants. Once the launcher’s tanks were chilled down, cryogenics began flowing into the two stages of the vehicle – the first stage being filled with 133 metric tons of LOX and 26 tons of LH2 while the second stage received 14,900kg of cryogenics. The two-hour fueling sequence was by the book and all propellants entered a stable replenish to be kept at flight level until late in the countdown. The launch team initiated a second round of checkouts including a repetition of communication checks to verify the rocket was in readiness for the launch. Data flow tests with ground stations were completed as well when clocks headed inside the last hour of the count. The setup for the Synchronized Countdown Sequence included the upload of a refined flight software package to the flight computers based on the most recent upper level wind models. All ground systems were transitioned to their launch support mode and the two satellites sitting atop the rocket began their transfer to internal power and were switched to launch mode. Final verifications of launch vehicle, payload and weather status were performed at L-10 minutes. No concerns were voiced and all status panels remained green as clocks entered T-7 minutes, marking the start of the Synchronized Sequence that includes the final events needed to transition the Ariane 5 to its autonomous liftoff configuration. Propellant topping on the first stage ended at T-6 minutes and 30 seconds coinciding with the activation of pyrotechnics on the ground and the rocket as well as the termination of Helium loading and securing of ground interfaces. Four minutes ahead of launch, the propellant tanks of the first stage were isolated and began pressurizing for flight followed by the second stage LOX tank at T-3:50 and the LH2 tank another forty seconds later. The HM-7B engine on the second stage went to its pre-deflection position while the Vulcain 2 main engine of the Core Stage opened its bleed valves and closed chilldown valves to get ready for ignition. One minute ahead of launch, Ariane 5 switched to battery power, still being controlled by computers on the ground. Ignition sequence start was commanded at T-37 seconds to ring in the final steps prior to engine start, notably the activation of the attitude control system, the POGO vibration suppression system and the retraction of the cryogenic feed arms at T-6 seconds. Having been handed full control of all vehicle functions, Ariane 5 commanded its Vulcain 2 engine to ignite when clocks hit zero at 20:30:00 UTC. Soaring up to a thrust of 98 metric-ton-force, the engine was carefully monitored by computers to ensure it reached operational conditions before the point of no turning back – the ignition of the boosters. With Vulcain 2 running smoothly, the twin boosters were commanded to ignite at T+7.3 seconds, enabling the 777-metric-ton Ariane 5 to make a thundering blastoff. Delivering a thrust of 1,420 metric-ton-force, equivalent to ten Airbus A380s at full throttle, the 53-meter rocket quickly gained altitude as it made a vertical climb. The twin boosters delivered 92% of total thrust during the initial flight phase. Five seconds after liftoff, Ariane 5 began its pitch maneuver followed by the roll maneuver another five seconds later to get the vehicle aligned with an easterly departure path for a fast trip across the Atlantic Ocean, homing in on a low-inclination orbit. The pitch and roll were completed by T+32 seconds and Ariane 5 pushed through the sound barrier 49 seconds after liftoff. Thundering away under the power of its boosters and core stage, Ariane 5 burned 3,600 Kilograms of propellant each second of the flight. 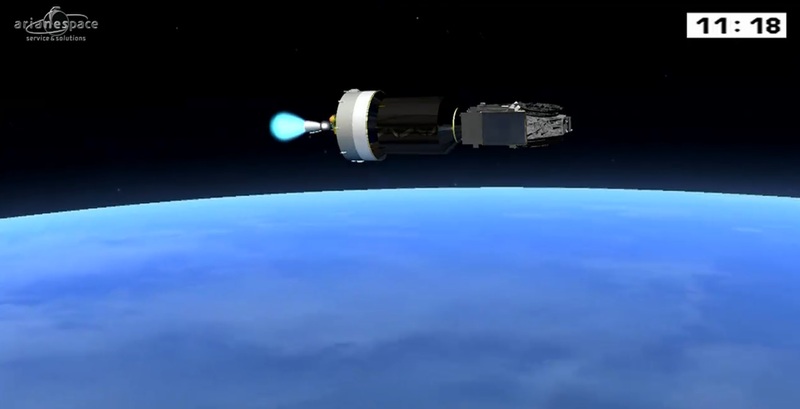 When reaching 13 Kilometers in altitude, Ariane 5 entered the area of maximum dynamic pressure, but continued to show a nominal performance, heading down the planned trajectory. Helping accelerate the rocket to a speed just above two Kilometers per second, each of the twin boosters burned through 237,000 Kilograms of propellant. The EAP booster measures 31.6 meters in length and 3.05 meters in diameter, capable of delivering 6,470 Kilonewtons of thrust. Burnout of the boosters came two minutes and 22 seconds into the flight, sensed by the launch vehicle through the drop in chamber pressure on the solids. Upon burnout, the SRBs were jettisoned by pyrotechnic systems and retrorockets firing on each booster to push it outward and away from the vehicle that was 67 Kilometers in altitude at the time. 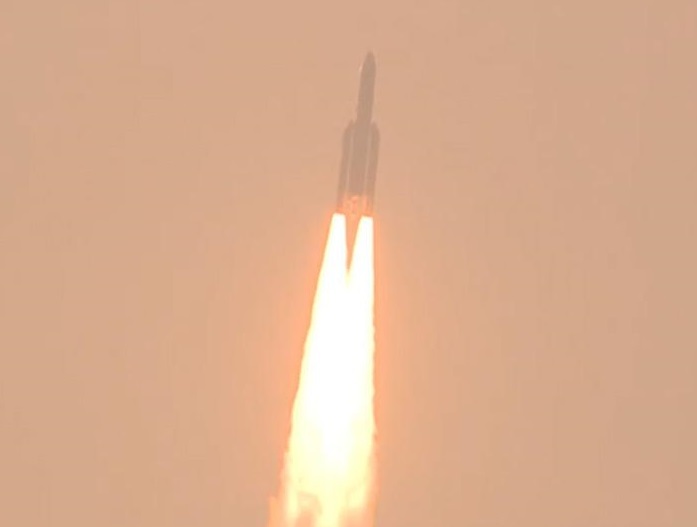 After a clean separation of the boosters, Ariane 5 relied on its Vulcain 2 engine alone, burning 290 Kilograms of cryogenics per second to generate a thrust output of 136,600 Kilogram-force in the rarefied upper atmosphere. Three minutes and 20 seconds after liftoff, Ariane 5 had departed the dense atmosphere flying at an altitude of 109 Kilometers. Splitting open the fairing halves, Ariane 5 initiated the jettisoning of the fairing to expose its passengers, Sky Muster sitting in the upper slot atop the Sylda adapter under which ARSAT-2 was making its way way into orbit. No longer in danger of damage by aerodynamic forces, the satellites could be revealed safely and Ariane 5 could shed some no longer needed weight. 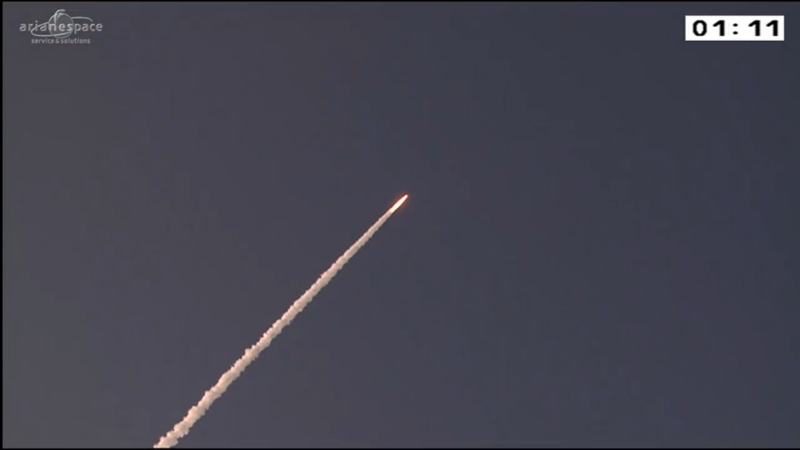 Picking up the pace, Ariane 5 headed downrange from French Guiana, being passed from ground station to ground station to keep up a steady stream of telemetry from the rocket for analysis in real time and to be stored for in-depth reviews after the flight. The first downrange station was Natal that came into play eight minutes into the flight to cover staging since the Galliot station was expected to lose the signal from Ariane 5 right around the time of stage separation. The Vulcain 2 engine of the first stage was shut down eight minutes and 51 seconds into the flight when the 30.5-meter long, 5.4m diameter stage had consumed its propellant supply – lofting the stack into a sub-orbital trajectory with a 157-Kilometer apogee. Separation of the stages came six seconds later as pyrotechnics fired and loaded springs pushed the spent core stage away to head for re-entry and splashdown. Igniting its HM-7B engine just after passing T+9 minutes, the second stage took on its task of boosting the two satellites into their target orbit by firing for just over 16 minutes in order to increase the apogee to Geostationary Altitude and slightly reduce the inclination. Providing a vacuum thrust of 6,400 Kilogram-force, HM-7B burned 15.5 Kilograms of propellants per second, stored in the tanks of the 4.7-meter long second stage. Ariane 5 passed its minimum altitude of 143 Kilometers 14 and a half minutes into the flight in a setup that focused on gaining speed by flying a flat trajectory before heading up the hill. Reports from the launch team remained positive throughout the second stage burn during which the vehicle was handed from the Natal ground station to the tracking station on Ascension Island followed by the Libreville Station in Gabon and the Malindi station in Kenya that was covering the rest of the mission through passivation. 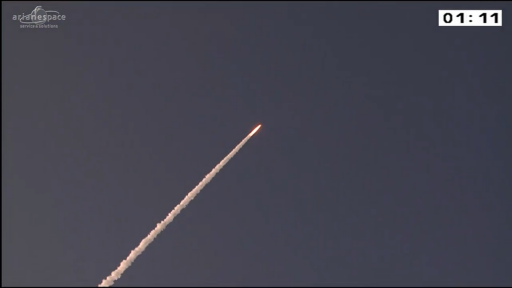 The VA226 mission of Ariane 5 aimed for an orbit of 250 by 35,786 Kilometers inclined 6.0 degrees, targeting an insertion altitude of 640 Kilometers and a speed of 9.37 Kilometers per second. Second stage cutoff occurred just after T+25 minutes as the mission transitioned from the propulsive phase to the equally important ballistics phase. For this mission, the ballistics phase was set up to transpire in a rather swift fashion, only with short gaps between separation events. The vehicle began with a re-orientation that set up for the release of the first satellite. 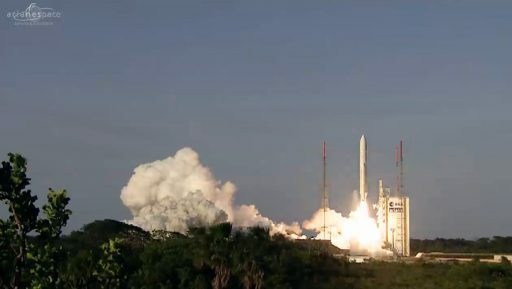 The 6,740-Kilogram Sky Muster satellite was sent on its way just shy of the T+28-minute mark to enter orbit for its 15-year mission dedicated to delivering high-capacity broadband communications to Australia. 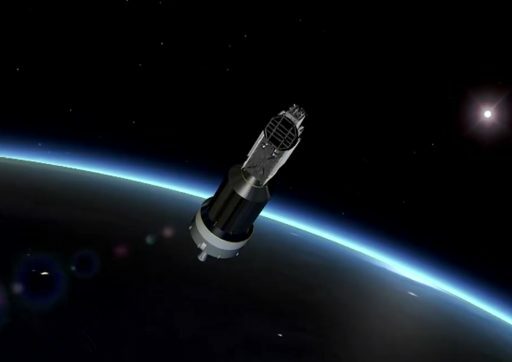 With the first satellite on its way, the second stage again used its Hydrazine-fueled attitude control thrusters to maneuver to the proper orientation for the jettisoning of Sylda that had facilitated the Sky Muster satellite for its ride into orbit. Sylda was released 30 minutes after liftoff, revealing the ARSAT-2 satellite for the first time in flight. The ESC-A stage then retreated from Sylda, re-oriented for the second satellite separation and spun-up as required by the payload. ARSAT-2 separation was confirmed just before T+33 minutes as the 2,977-Kilogram satellite was set free to begin its own mission, delivering TV and data services to the Americas, further building Argentina’s experience in large space projects. The separation of the two satellites marked the success of the VA226 mission, the 82nd flight of Ariane 5 and its 68th consecutive success, though the second stage was still tasked with the usual collision avoidance and passivation maneuvers to achieve a safe state. For Arianespace, October will be a quiet month in terms of launch operations, but processing will be continuing at full speed as thee concurrent launch campaigns are currently in progress, all aiming for liftoff before the end of the year. 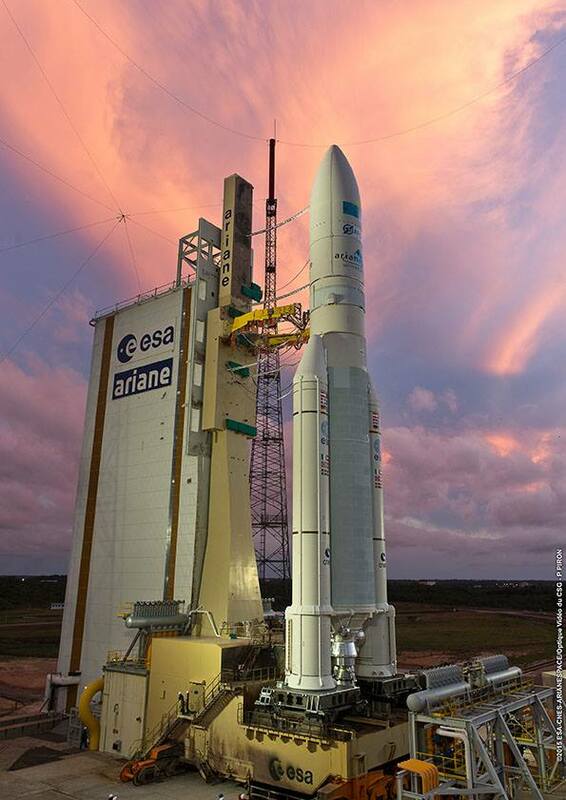 The next Ariane 5 mission will deliver Arabsat-6/Badr-7 and GSAT-15 to orbit on November 5, to be followed by the small Vega rocket in late November, lifting the LISA Pathfinder for ESA. 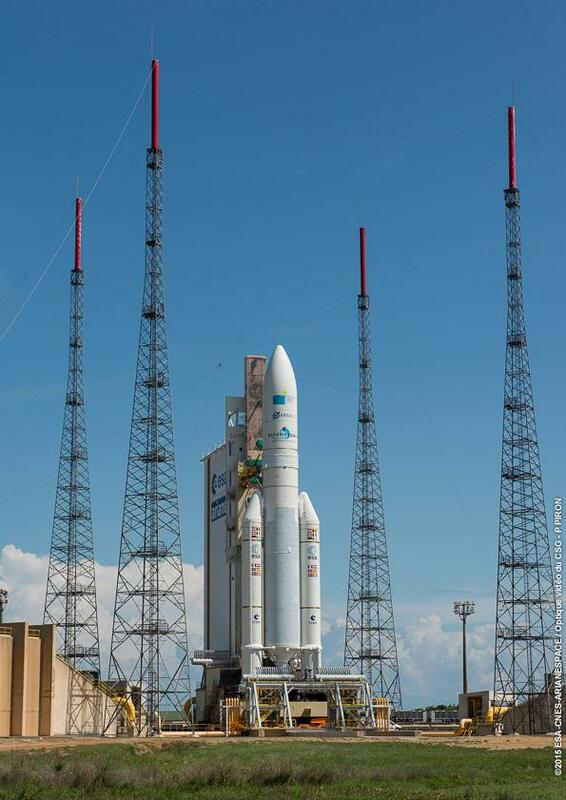 To close out a busy 2015, Arianespace will launch the next two Galileo navigation satellites using the Soyuz launcher.